“In space, we see better-quality crystals—better quality meaning they diffract to a higher resolution. The higher the resolution, the more detailed the structure,” said Dhirendra Simanshu, Ph.D., a principal investigator on the study. The more detailed the structures, the more scientists can learn from them. Protein molecules are too small to image one by one. But under laboratory conditions, scientists can coax purified protein molecules to pack together in a repeating array, an ordered structure with symmetry and facets similar to those of mineral crystals. Good crystals can be processed to produce high-resolution, three-dimensional images that can reveal targets – dimples or pockets on the surface – to which drug molecules might take hold and have therapeutic effect. If successful, the space-bound experiment is expected to reveal physical features of some of the most deadly and difficult to target proteins involved in cancer. Mutations in KRAS proteins are responsible for one-third of all cancers, including those of the colon and lung, and almost all cancers of the pancreas, which are virtually untreatable. Scientists have been trying for more than 30 years to identify a candidate drug that will be effective against cancers caused by KRAS mutations. The Frederick National Laboratory is collaborating with the Center for the Advancement of Science in Space– which manages the International Space Station U.S. National Laboratory – to crystalize KRAS proteins in the microgravity of the space station. KRAS proteins have been especially difficult to fully crystalize under earthbound conditions, Simanshu said. Even the space shot is no guarantee of success. The experiment, designed by Albert Chan, Ph.D., will also include a novel drug compound developed by a team led by Anna Maciag, Ph.D., in collaboration with the University of California, San Francisco, and pharmaceutical company TheRas. 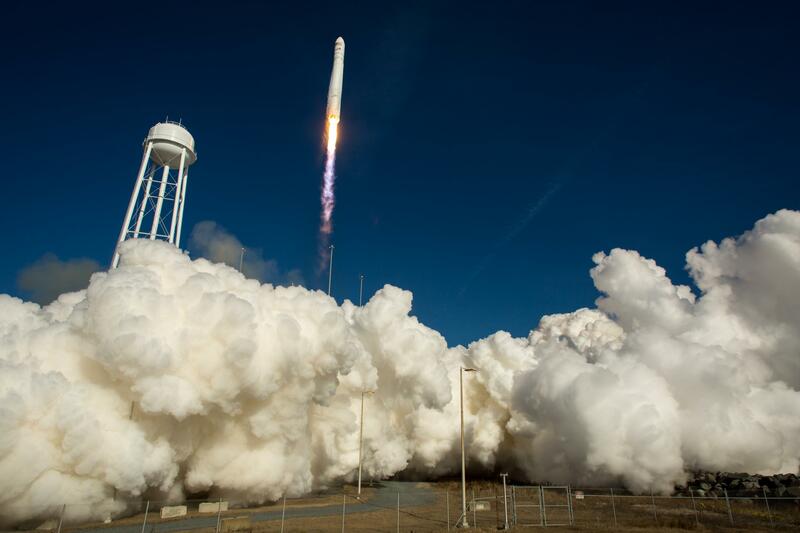 Top image: An Orbital Sciences Corporation Antares rocket is seen as it launches from Pad-0A at NASA's Wallops Flight Facility, Thursday, January 9, 2014, Wallops Island, VA. NASA on The Commons image. Second image: Surface rendered image of KRAS. Illustration by Dhirendra Simanshu and Albert Chan.